Lockheed Martin has received a $305.4 million contract from the U.S. Air Force for continued production of the Joint Air-to-Surface Standoff Missile and its Extended Range version. The Lot 13 contract includes 140 baseline JASSMs for U.S. and international partners, 140 JASSM-ER missiles, data, tooling and test equipment. The Lot 13 award represents the largest JASSM-ER order to date and brings total missiles under contract to more than 2,300. The contract represents the fifth production lot for JASSM-ER, which received full-rate production approval last year. Recent program milestones include a Foreign Military Sales contract to integrate JASSM onto Poland’s F-16C/D aircraft and an additional contract in support of F/A-18C/D aircraft integration for Finland. Armed with a penetrating blast-fragmentation warhead, both missiles can be used in all weather conditions. They share the same powerful capabilities and stealth characteristics, though JASSM-ER has more than two-and-a-half times the range of JASSM for greater standoff range. 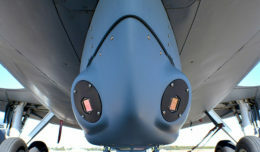 These 2,000-pound cruise missiles employ an infrared seeker and enhanced digital anti-jam GPS receiver to dial into specific points on targets. Produced at the company’s manufacturing facility in Troy, Ala., more than 1,700 JASSMs have been delivered.